Rats! They Could Be Better Than Mice For Testing Alzheimer's Drugs : Shots - Health News Most potential Alzheimer's drugs are tested on mice. 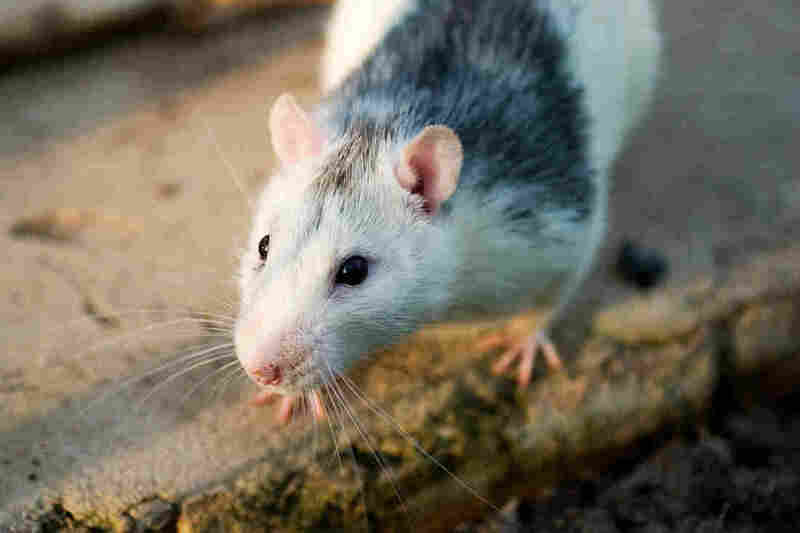 But rats may be a better choice because they seem to have a type of memory that's more like ours, and also are highly vulnerable to Alzheimer's. Rats are great at remembering where they last sniffed the strawberries. What rats can remember may help people who forget. Researchers are reporting evidence that rats possess "episodic memories," the kind of memories that allow us to go back in time and recall specific events. These memories are among the first to disappear in people who develop Alzheimer's disease. The finding, which appears Thursday in Current Biology, suggests that rats could offer a better way to test potential drugs for Alzheimer's. Right now, most of these drugs are tested in mice. "We need to have a way to study the exact type of memory that we think is impaired in Alzheimer's disease," says Bruce Lamb, a professor of medical and molecular genetics at Indiana University in Indianapolis. He was not involved in the study. The lack of an adequate animal model of Alzheimer's disease may be one reason drugs that seemed to work in mice have failed when given to people, Lamb says. Loss of episodic memories, especially recent ones, is a key sign of Alzheimer's, says Jonathon Crystal, an author of the study and director of the neuroscience program at Indiana University in Bloomington. "So if you visit your grandmother who has Alzheimer's, [she] isn't going to remember that you were visiting a couple of weeks ago and what you described about things that are going on in your life," he says. Crystal and a team of researchers thought rats might have some form of episodic memory. So they began doing studies that relied on the animals' remarkable ability to recognize a wide range of odors, like basil and banana and strawberry. The latest study, led by graduate student Danielle Panoz-Brown, tested the animals' ability to remember whether they had detected a particular combination of odors, and, if so, where that event had occurred. "And what we find is that the rats are really adept at this," Crystal says. The animals remembered more than 30 odor events, a finding that suggests their brains can handle a large number of episodic memories. So far, mice have been used for most animal research on Alzheimer's. That's because they are cheaper and because of the wide availability of lab mice that have been genetically altered to develop brain diseases similar to Alzheimer's. But there's evidence that rat brains have more in common with human brains. And researchers are developing rat models of Alzheimer's that seem to do a better job mimicking the human disease. So it may be time to give rats another look, says Lamb, who is co-leading a $25 million, government-funded effort to develop better animal models of Alzheimer's. "We're going to initially focus on mice," he says, because they are so widely used by researchers. "But we hope to expand this to rats."